The 2017 Joint Employment Report and its Scoreboard of Key Employment and Social Indicators provide a snapshot of employment and social developments in the EU. 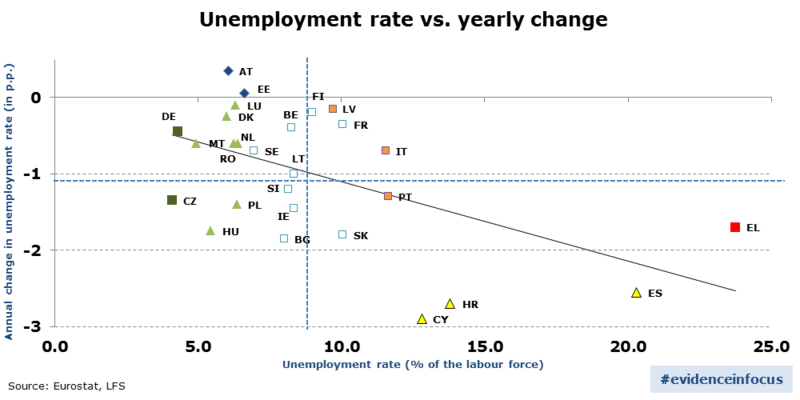 This analysis provides a focus on unemployment and Member States' efforts in the labour market to bring it down. The graph shows on the horizontal axis the average unemployment rate in the first half of 2016 and on the vertical axis the change compared to the same period of 2015. If a Member State is above the 0% line, unemployment goes up. Below and it goes down. In 26 Member States unemployment went down. The drop in unemployment continued in the last quarters of 2016. Overall, 20.9 million people were unemployed in 2016, compared to 22.9 million in 2015 (i.e. 2 million less). This decrease was driven by strong job creation, with 3 million more people in employment. We also see stronger-than-average decreases in Member States where unemployment rates were highest (in particular Cyprus, Croatia and Spain where it has gone down by more than 2.5 p.p. over the period). This evidence points to on-going convergence across the EU. Continuing this trend, which started in 2014, will gradually reverse the increase in disparities which happened during the recent economic crisis. Period: 1st half 2016 levels and yearly changes with respect to 1st half 2015. Note: Axes are centred on the unweighted EU average. The legend is presented in Annex 4 of the JER. A break in the LFS series occurred in Denmark in 2016. Improving the governance of active labour market policies (e.g. Italy, Spain). While developments go in the right direction there remain large differences in unemployment rates across Member States: from less than 5% in Czech Republic, Germany, Malta and the United Kingdom, to around 20% or more in Spain and Greece. Though decreasing as a percentage of the active population, long-term unemployment still accounts for almost 50% of total unemployment, and remains very high in some Member States. This situation is associated with a depreciation of skills, lower attachment to the labour market and ultimately higher risk of social exclusion. Policy efforts must be continued to promote the creation of quality jobs and more inclusive labour markets. Read our post next week on policies that address poverty and inequality. The views expressed in this article are those of the authors and do not necessarily reflect the views of the European Commission. Editor's note: this article is part of a regular series called "Evidence in focus", which will put the spotlight on key findings from past and on-going research at DG EMPL.